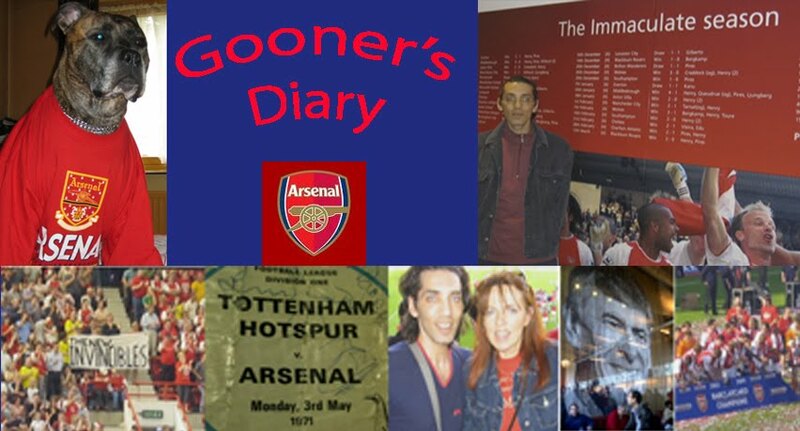 Gooner's Diary: High-Spirited It May Be, But It’s Hardly Haute Cuisine! High-Spirited It May Be, But It’s Hardly Haute Cuisine! It would appear that the Gunners’ foreign contingent have yet to get to grips with our festive customs. Evidently they’ve failed to understand that tradition has the turkey getting stuffed, not them! I can fully appreciate Arsène’s concerns about the exhausting Xmas schedule and its effects on our young squad. In truth we were fortunate to come away from our trip to Vicarage Road with all 3 points and there’s no denying that compared to his brilliant displays earlier in the season, the likes of Fabregas were beginning to look a little jaded. However if Wenger truly feels that squad rotation is the only means by which he can avoid the relentless round of festive fixtures taking its physical and mental toll, then to my mind he should’ve left Fabregas at home with his feet up. Or perhaps Arsène should’ve been a little braver and gone the whole hog, by playing our Carling Cup side. At least they’d have arrived at Bramall Lane with plenty to prove and would’ve been guaranteed to have grafted. Rather than a first team, who, after being energised by the atmosphere and a rousing chorus of the wonderfully evocative Greasy Chip Butty tune (one of my favourite all time terrace anthems), to produce a profligate flurry of opportunities during the opening 10 minutes, all that initial vim and vigour evaporated and the display that followed suggested that they felt all 3 points were on offer just for turning up! There would’ve been some consolation to blowing the points at Bramall Lane, if we’d returned for the Charlton fixture somewhat refreshed. Instead of which we’ve ended up losing ground on the likes of Bolton and Liverpool and having been forced to send Cesc on as a sub, to chase the game, Fab’s ended up no less knackered than if he’d played the entire 90. Perhaps most worrying of all, it was Cesc’s desperate desire to rescue a result that was responsible for the senseless tackle, for which he deservedly had his name taken, but which could end up costing us our FA Cup aspirations, with our best player subsequently suspended for our 3rd round trip to Anfield. It’s all too easy to be wise after the event. Yet following on from our disastrous defeat at Craven Cottage, surely Arsène must be aware of the cause and effect psychological consequences of selecting a weakened side. You can be darn sure that Warnock will have made the most of this apparent show of disrespect, as a motivational tool to fire up his troops. But I’m also convinced that leaving players out is bound to have a negative impact on our lot, as Wenger is sending out an unspoken signal that we don’t have to be at our best to beat the likes of the Blades. Thus it should be no surprise that this is exactly what we got, a performance that bore very little resemblance to an Arsenal side at its best. It was ironic to hear that Anthony Stokes had scored yet another hat-trick earlier in the afternoon. Personally I’ve not seen enough of the young Dubliner to pass judgement, as he’s never played in his preferred striking role in the few reserve team outings I’ve witnessed. Some would suggest that as a striker, Stokes is a yard short of the searing pace necessary to hack it at the very highest level (although this never hindered Teddy Sherringham) and according to rumour, Wenger will be cashing in on his prolific spell at Falkirk, by flogging him in the transfer window. However considering Stokes currently sits atop the SPL scoring charts, I’m fairly certain he’d have proved far more suited to the unforgiving conditions and the physical nature of the battle at Bramall Lane, than an almost anonymous Aliadière. In fact, even if Anthony is not destined to win us the Champions League, if he’s capable of doing a job for us, on nights such as this, when some of his less doughty team mates obviously don’t relish rolling up their sleeves for such a scrap, then surely Stokes would prove a far more useful option than another airy-fairy, foreign bench-warmer? Also you’d imagine Baptista would’ve been the ideal choice up front in such a muscular contest, since “the Beast” is built like the proverbial brick out-house. Yet no matter how much time he’s given, I am not convinced Julio’s ever going to adapt to the Premiership and I’m not certain he wants to. Much of the time Baptista treats the ball like a hot potato, preferring to release it before he can be targeted by a tackle. On the rare occasions when he did receive possession at Bramall Lane, either his first touch let him down, perhaps because he was intimidated by the defender’s imminent attentions, or when he did control the ball, instead of the Blades bouncing off him, as one would’ve expected, Julio looked like a lightweight, all too often hitting the deck and demanding protection from the ref, when he should’ve been protecting the ball. One of principle differences between playing in the Premiership and La Liga is where in Spain Baptista would often have time to control the ball and look up to consider his options, there’s no such luxury in this sort of breakneck encounter, where it’s necessary to have a picture of what one intends to do with the ball, before it arrives at one’s feet. This robust climate tends to expose those who don’t have the footballing brain and speed of thought of a Bergkamp or a Fabregas. If I was left with one enduring image from our defeat at Bramall Lane, it was the sight of Baptista sitting on his backside in the mud, looking more like a dispossessed baba than a Beast, wondering what on earth he was doing there, when he could be counting his money back in Madrid. No one will be happier if he’s yet to prove me wrong, but I wouldn’t be surprised to see Julio make a swift return to the Continent at the earliest opportunity. I can’t remember the last time Kolo Touré had such a stinker, nor can I ever recall the brawny Ivorian being outmuscled by an opposition striker. However sadly such rare mistakes from our most reliable centre-back were all the more likely to prove costly with Justin Hoyte at right-back. I’ve been prepared to cut Hoyte plenty of slack, because I’m so desperate to see at least one homegrown youngster in this Arsenal side. But there comes a point where even I have to admit that, defensively, Hoyte just can’t cut the mustard. Mercifully the long-awaited return of Lauren should restore some much needed stability to the right side of our defence and when you add the experience of Gallas to this mix, hopefully we’ll once again have the sort of solid backline, which would’ve at least got away with a clean sheet and a point from Saturday’s lacklustre display. Obviously, along with everyone else, I’d love to win the lottery, but if I’ve one realistic wish for the New Year, it is for the return of a reinvigorated Thierry Henry, whose potency at the other end of the pitch would ensure that any defensive inadequacies pale into insignificance. I was hoping we might be in for a game of “three and in” when Jagielka put on the keeper’s jersey and I’m not surprised Lehmann eventually went up for the last corner, as like me, he must have been baying for us to at least test the stand-in keeper, with a shot on target. In the Times it was described as “a brilliant, pulsating night” but personally I prefer my football to be foie gras, than Sheffield’s high-spirited but ultimately stodgy porridge. Don't Like It Up 'Em?....I Should Coco!